This review assumes a basic understanding of the appropriate technology. Reviewed October 2008. Also: Ricoh Caplio review updates - our ongoing findings in the following years. Technology marches on and with our trusty digital cameras - a Fuji from 2002 and a Canon from 2004 - rapidly approaching old age we thought it time to search out a modern replacement. Since these models' heyday digital cameras have become smaller, lighter, more powerful and contain more useful features than Dr Who's sonic screwdriver! So, having justified the need for a shiny new digital camera, we drew up a list of the main features we required. Now, as keen walkers we obviously needed a small and light model, fairly robust and easy to use. Oh, and it must take good pictures too! Next, we carried out our usual 'savvy shopper' pre-purchase exercise (that sounds good!) and researched the current digital camera market, read the online and consumer press reviews, checked out the forums, created a shortlist, decided the Ricoh Caplio R7 digital camera was the one for us and then compared prices. Now, shopping comparison websites are all well and good, but we prefer to do our own price comparison research as we've often found even keener prices this way. The Ricoh Caplio R7 digital camera had actually been superseded by the R8 at the time of our purchase, but as this model gained less favourable reviews and was a tad larger and heavier, we stuck with the R7. Above right. Belinda takes a shot with the Ricoh digital camera. The Ricoh Caplio R7 digital camera is a compact 8 megapixel (mpx) model, with a wide-angle 7x optical zoom lens capturing shots to SD card. It has the ubiquitous face recognition technology plus a multitude of scene modes (eg. landscape, sports, portrait) and the ability to customise two setting groups. Image-shift picture stabilisation provides camera shake correction and a continuous mode allows taking multi-shots rapidly. Time exposure and time interval capture are also available. An ADJ joystick provides quick adjustments of assigned functions such as exposure, white balance and ISO sensitivity. Other digital camera features include a macro for close-ups to 1 cm, in-camera editing of brightness and colour, dual image size capture, skew correction, focus/exposure zone specifying and settings to limit ISO and low shutter speed. We're not finished yet! The information display (which can be toggled) on the large 7 cm LCD provides oodles of feedback including a histogram, white saturation indication, a camera levelling grid and exposure and focus indicators. There's a multitude of image reviewing/playback/selection functions and PictBridge compatibility for direct printing via USB. Finally, video (with sound) can be shot at two sizes and two frame rates. Phew! Taking a shot with the Ricoh Caplio R7. The bar on the left of the LCD screen is the zoom scale. amongst other stuff, the histogram. You might think with all those features the Ricoh Caplio R7 digital camera would be a nightmare to set up. However, as the menus are laid out logically and we're familiar with digital camera technology, we figured it all out pretty quickly. Picture quality settings - As we use our photos for a variety of purposes we first customised the two setting groups in the 'My Settings' mode. We selected the highest 8mpx quality at fine compression for general use and a lower 1mpx for images we knew we would be taking exclusively to prepare for web publication. Focus/metering - we plumped for the default multi-zone settings and decided to experiment with the others as we went along. ADJ joystick - we left largely at the default settings of exposure, white balance and ISO, just assigning continuous mode for the forth option. Other settings - We limited the slow shutter to ¼ sec, the ISO to 400, beep sound to low, time on screen to 1 sec and power off to 5 min. All other image settings that affect the image - such as sharpness, colour depth, auto bracket, digital zoom image, dual size and date imprint - we set to 'normal' or 'off' as we figured these can all be added/adjusted if required with our image editing software afterwards. We set the camera shake correction to 'on' (which should help Mike take steady shots after visiting the pub!). We tested our Ricoh camera with the same (exciting!) testing procedure we put our hybrid camcorder through (see review) a few years back. This involved taking a series of images at different quality settings of our riveting mixed scene comprising of: a road, trees, grass, a car, a brick wall and a house in the medium distance with name sign - it doesn't get much more exciting than this! Then we analysed the resultant images on our gamma calibrated computer. All the images were far better than those produced by the camcorder's digital stills mode at comparable settings (which was plagued by fuzzy edges and image noise). On the Ricoh the quality did drop off at the lower pixel sizes, 640x480px (0.3mpx) and 1280x960px (1mpx), but this was as expected. The setting at 2048x1536px (3mpx) produced a much more dynamic image than the camcorder could manage at this size (its maximum). Moving up to 2592x1944px (5mpx) resulted in quite a well-defined and detailed picture, but of course the highest 3264x2448px (8mpx) produced the best - sharp, lots of detail, well-defined edges and no intrusive image noise. We had no problem making out the house sign when zooming in on the computer displayed image taken at 5mpx and 8mpx, even the 3mpx image had a good stab at it. All the images looked well exposed on the sunny summer's day of our test, showed reasonable detail in shadow areas and the highlights were not over-saturated. We felt the auto-exposure tended to slightly over-expose, but not excessively and the colour saturation appeared reassuringly natural. We compared the wide-angle lens and 7x optical zoom with our older cameras. Zoomed in at the full 7x corresponded to roughly 5x on our standard angle cameras. But of course the Ricoh's wide-angle lens is wider in the first place (which is more useful anyway) so this isn't really surprising. Horizontals and verticals maintained linearity throughout the zoom range except at the wide end where they bent in a little, as normal for a wide-angle lens. The only other specific tests we tried with the Ricoh digital camera was the picture stabilisation shake correction and low light capabilities. Both worked very well and the camera managed to capture usable shots in low light handheld situations (before Mike had a pint! ), even when the shutter speed was down to ¼ sec. In very low light, eg. a street scene at night, we found the best results were obtained setting the ISO to 1600 (or high sensitivity scene mode which seemed to do the same thing) and a slow shutter, rather than using the exposure compensation and/or nightscape scene mode. 1600 ISO does give a rather noisy and grainy image, but in this situation that's preferable to a dark, blurry one! Of course, the Ricoh does have a flash if that'll be more effective, but this depends on your particular scene. Mike in the pub by candlelight. This handheld shot had a 1/4 sec exposure and ISO 800. We covered the image pixel sizes above, so what about JPEG compression? The Caplio R7's quality settings are limited to 'normal' JPEG compression at the lower pixel sizes, only adding a choice of 'fine' at 8mpx. This size also adds an option to take photos at the traditional photographic 6:4 aspect ratio (fine compression only) which should prevent your photos being cropped top and bottom when printed at a mini-lab. No more shots with the top of Aunt Doris's head missing then! The inability to use fine compression at the lower sizes isn't really a problem as most owners will probably only use the highest quality setting, unless running low on SD card space. But should the lower sizes be used the normal compression seems to over-compress images at 1.6 compressed bits per pixel, as read from the metadata (EXIF) embedded into the image files. Even the fine setting of 2.8 bits / pixel seems rather an over-compressed value. However, we didn't notice any intrusive JPEG compression artefacts - sometime called JPEG jaggies - until close scrutiny on the PC, so maybe improved compression algorithms are employed. Still, we'd prefer it if the compression was less, after all the resultant higher file sizes shouldn't be a problem with the copious amount of memory available these days! We bought our Ricoh Caplio R7 digital camera just before our Gower holiday so that trip became our first 'live' testing ground. As this was essentially a walking holiday we soon came to appreciate the camera's small size, low weight and comfortable handling. Generally, the features we found to be the most useful were the wide-angle lens, camera shake correction and low light capabilities. At the Gower Heritage Centre the wide-angle lens came into its own when it proved to be a godsend in restricted room situations. In the past Belinda's lost count of the times Mike's moaned: "I can't get back far enough to get it all in!" Some of the exhibits were in dim surroundings which gave us a chance to access the low light capacities. Being able to quickly adjust exposure compensation and ISO via the ADJ joystick was extremely useful here and it enabled us to easily capture a good photo without flash, although grain became more apparent at ISO 800 and above. Adjusting the white balance was also quick and effective via the joystick for those displays illuminated with 'mood lighting'. Above right. The camera's white balance coped well with mixed and odd lighting. We had ample opportunity to try out some of the various scene modes. At the breathtakingly scenic Three Cliffs Bay and Rhossili Bay we took various photos in normal and landscape modes and compared. Surprisingly, landscape mode seemed less involving in the less than perfect weather conditions, maybe it would work better in brighter weather. However, face recognition and portrait modes worked well, correctly concentrating focus and exposure in the right areas. Left. Mike's correctly exposed face and the Rhossili Bay landscape (or is that seascape?). During the holiday we indulged in our hobby of Geocaching. When logging our finds we like to post a picture of the area, and as this image is destined for web only we tried out the lower quality (1mpx) setting we had previously assigned in 'My Settings' mode. While this ability to switch quickly was useful, we found it all too easy to forget to switch back to high quality and - gasp - almost ended up with a bunch of lower quality photos for the rest of the holiday! Right. Belinda finds a geocache (or is she hiding her lunch from Mike?). Despite a lot of use, the slim rechargeable battery easily lasted a day's touring; in fact we only needed to charge it once during the whole week! Best to carry a charged spare though. You can view more photos taken with our Ricoh digital camera in our Portsmouth Historic Dockyard gallery. 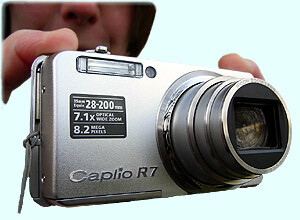 The Ricoh Caplio R7 digital camera has a movie mode. Apart from experimentation we haven't used this as, after all, that's what our camcorder's for. Video (with sound) can be captured at either 640x480 or 320x240 pixel sizes and 30 or 15 frames a second. Might be OK for YouTube. Nor have we found a need for the skew correction, text mode, B&W, or Sepia - in fact all the modes on the lower scene modes line. All of this can be achieved with suitable image editing software anyway, as can many of the additional camera settings such as sharpness, dual size and digital zoom image. Much better to concentrate on capturing a good original photo and do any manipulation in post-production. Alarmingly the camera spews a fair amount of operational noise, mainly from the lens mechanism. Although it sounds like rough mechanicals, everything works fine and it's not a cause for concern. More of a long-term worry though is the tiny yellow 'hook' type battery retaining clip which seems rather flimsy. And it's all too easy to unintentionally slide open the battery / SD card panel during use, particularly when attaching a tripod or monopod. Multi-area focus and multi-area auto-exposure (AE) appears to cause mis-focusing and incorrect exposure in some instances. We found setting the focus to spot and AE to centre in the menu produced better results. The digital camera has a small internal memory and is compatible with high density SD cards. Images can be transferred between both memories. The ability to make quick adjustments via the ADJ joystick has proved invaluable; the exposure compensation setting works well when small increases or decreases are required and we can quickly set the continuous shot mode to take pictures at a two-per-second rate in order to hedge our bets at getting at least one good shot! Of particular note are the thoughtfully provided dedicated buttons for the flash, macro and self-timer. After all, there's nothing worse than having to faff around in the menus trying to find these often used functions under pressure, in a hurry, with everyone waiting! Too many features for a compact camera? In 2006 we purchased a hybrid camcorder that we hoped would enable us to carry just one small camera for both digital video and still photography. But this apparent convenience didn't quite work out (article update) as expected. Our Ricoh digital camera's small size and weight now largely negates that need. Baring a few niggles, the camera has proved a worthwhile successor to our previous digital models and we've definitely benefited from the additional features and improved technology. Now we wonder what technology will offer us in another few years when this Ricoh, in turn, approaches its old age (credit crunch permitting)! As for Dr Who's screwdriver, that's ageless! We've added updates to this Ricoh Caplio review in following years. © micbinks 2008. Please ask permission if you wish to reproduce any of our content.